We've reached the stage where things seem to be a struggle. Nearly eight months in and each day is a struggle with two children, I ask myself daily "am I doing this right?" I'm so consumed with trying not to muck up my children's lives, the weight of the honour of being able to raise them sits heavily on my shoulders at the moment. My boy is getting clingy and also resists sleep when he can. This makes me nervous and panicked that I'm doing something wrong. It's so strange because I've done it all before and where I am more relaxed in some areas in others I'm just as anxious as I was first time around. It's the self doubt and what ifs that get me, I wasn't expecting this stage to be the one to trip me up. 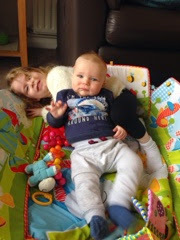 Up until now I've really enjoyed having two children and my boy has been a happy, joyful thing. But now he gets frustrated and those pesky teeth are giving him grief so some days all he does is moan. Often by the end of the day I'm an emotional wreck, I often cry and my poor husband doesn't know what kind of wife he is coming home to. It makes me feel like I'm rubbish at motherhood or I'm doing something wrong because I'm really not enjoying it at the moment. Most days are stressful and I feel like I could split in two because both children want and need something different at the exact same time. Is it supposed to be this difficult, is this normal or am I making it more difficult than it should be? Please let me know because no one else seems to struggle like I am and they all make it look really easy...and it's not!